momto3boys "Hope L." I bought this game for my 14 and 7 year old sons for Christmas. It is more challenging and fun than the original phase 10. If you love card games you have to check this one out. Comes in a collector's tin. The only down side is it is set up for 4 players and we play with 5 players so if you want more than 4 players you really need a second deck which i am going to go purchase a second one. It is a blast. I hope you card lovers give it a try! dougsprincess My husband and his family taught me how to play this game. It is SO ADDICTIVE! We usually get together in kind of a large group so it takes us hours to play. We were in Costa Rica this past summer on a mission trip and we had a 10-man game going. It took us 4 nights to finish! It's awesome!!! I love how it's any man's game. Someone can be up the entire game (or down for that matter) and in one hand his/her game can totally change. It's great when you play with sore losers too because they always blame someone for their loss when it's just the luck of the cards. Anonymous Phase 10 is something like a mix between poker and uno. It's pretty easy to catch on when first learning, and it's fun to play whether you're relaxing at home, playing with one other person or playing with a group of people. The package is fairly small and can be great for traveling. 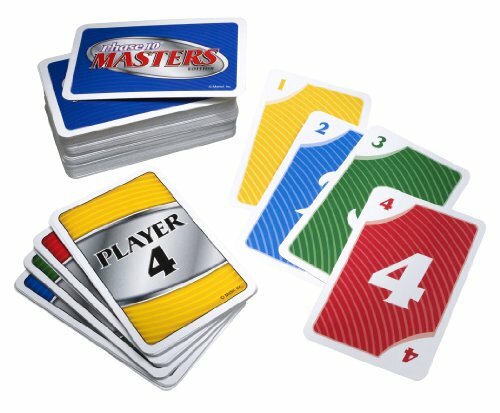 With the Masters Edition, the phase one chooses to attempt during a round is completely up to the player, whereas in the original version, phases are to be played in numerical order. Overall, I highly recommend this game. b-lockhart84 Phase 10 is something like a mix between poker and uno. It's pretty easy to catch on when first learning, and it's fun to play whether you're relaxing at home, playing with one other person or playing with a group of people. The package is fairly small and can be great for traveling. 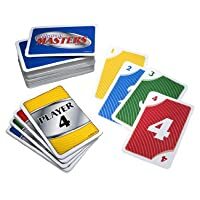 With the Masters Edition, the phase one chooses to attempt during a round is completely up to the player, whereas in the original version, phases are to be played in numerical order. Overall, I highly recommend this game. tin to put the cards in it.i hope you will enjoy playing the card game as much as i did. Kimmiee This game is easy to learn, plays rather quickly, and involves some strategy. This one has become one of our staples. PRT32 Phase 10 is a great game to play with family or friends. I highly recommend this card game. Leighann I enjoy playing Phase 10 with my family. Swanene I love Phase 10 and i play EVERY chance I get!